thermostable SSS in maize grains as compared with that in wheat grains. Endogenous ascorbic acid (AsA) and cytokinin content under drought stress correlated with the drought tolerance in wheat. Dehydroascorbate reductases (DHAR) gene involved AsA regeneration and IPT gene for cytokinin synthesis were cloned from wheat cultivar DBW39. A set wheat genotypes with staygreen trait under drought stress was identified based on phenotyping (on the basis of leaf senescence rate, drought susceptibility index, and yield parameters) of 70 genotypes. Functional staygreen genotypes with better tolerance to moisture deficit stress were identified.Stay green cultivars showed higher cytokinin level and stability in the expression of IPT gene expression under drought stress. The tolerant wheat cultivars showed higher accumulation of polyamines (putrescine, spermidine and spermine) and lower level of ethylene evolution.The tolerant wheat cultivars are associated with higher expression of SAMDC as well as other polyamine biosynthetic genes.The SAMDC gene was cloned from wheat cultivars with contrasting drought tolerance. 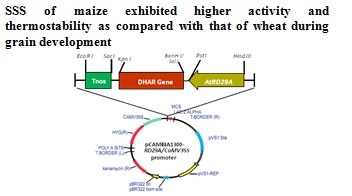 Variety development in wheat: Contributed to the development ofwheat variety HD 3086 (PUSA GAUTAMI) and HD 3118 (PUSA VATSALA). 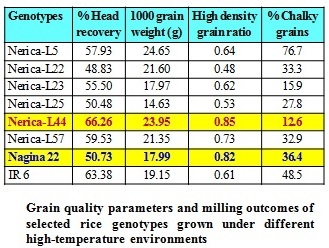 Evaluation of heat tolerance of large number of rice genotypes led to the identification of NERICA-L-44 as the most heat tolerant genotype based on survival percentage, spikelet fertility, 1000 grain weight, grain quality and grain yield. Anthesis in Nagina 22 occurs before 10AM, and thus escapes heat stress, while in NERICA-L-44 anthesis occurs at about 11:00AM and thus tolerates heat stress. This novel donor is currently used to develop RILs for trait dissection and gene mapping for heat tolerance in rice. HNT >22oC during reproductive phase was found to adversely affect spikelet fertility and consequently yield and grain quality, while HNT at vegetative stage reduced most of the other yield components. Non-availability of real-time, high throughput and non-destructive methods for quantification of relative water content (RWC) is one of the major bottlenecks in large-scale phenotyping of germplasm for drought tolerance. To overcome this problem, a high throughput hyperspectral method to assess RWC of rice under lab and field conditions was developed. Studies on late sown chickpea revealed that low temperature (December and January) inhibition of vegetative growth as one of the reasons for the low yield of late sown chickpea. Seedling vigour on dry weight basis was found to be high in Pusa 2024, BG5023 and BG 1088 at 15oC. These can be further exploited for early vigour under low temperature stress at vegetative stage. Abscisic Acid (ABA) signalling pathway: Contributed to the elucidation of the stress hormone ABA signalling pathway and mechanism of action of ABA receptor (ABAR) in stress responsive gene expression in Arabidopsis. 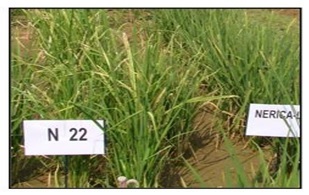 Genome-wide analysis led to the identification 10 ABAR genes from rice and these genes were cloned and sequenced from drought tolerant rice cultivar Nagina 22. Rice transgenic lines overexpressing OsABAR6 gene under constitutive and stress inducible RD29A promoter, and RNAi silencing lines were developed, and confirmed by molecular and physiological analysis. 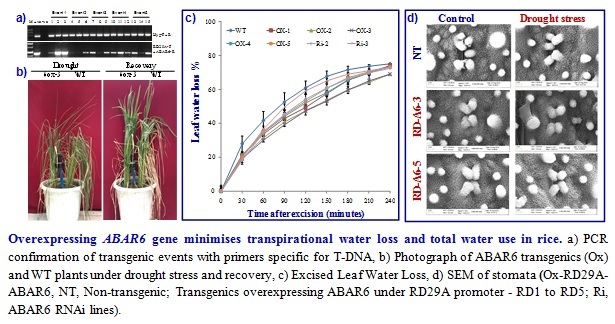 Rice transgenics expressing RD29A::ABAR6 gene showed enhanced drought tolerance by improving water loss minimization and cellular tolerance mechanisms of plant under greenhouse conditions. 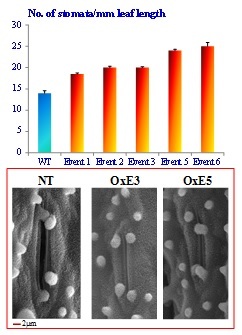 Overexpressing ABAR6 gene minimises transpirational water loss and total water use in rice.a) PCR confirmation of transgenic events with primers specific for T-DNA, b) Photograph of ABAR6 transgenics (Ox) and WT plants under drought stress and recovery, c) Excised Leaf Water Loss, d) SEM of stomata (Ox-RD29A-ABAR6, NT, Non-transgenic; Transgenics overexpressing ABAR6 under RD29A promoter - RD1 to RD5; Ri, ABAR6 RNAi lines). ICE1 pathway of cold acclimation is conserved among evolutionarily diverse plant species. 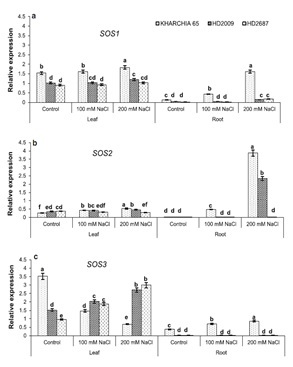 In addition to cold tolerance, transgenic Arabidopsis overexpressing AtICE1 also enhanced tolerance to NaCl and MV-induced oxidative stresses. Rice transgenics overexpressing AtICE1 under RD29A promoter were also developed. Overexpressing of AtICE1 reduced stomatal size but enhanced stomatal density in rice, and showed enhanced salt tolerance. AtICE1 overexpression enhances stomatal density (Top panel) but reduces size of the stomata (bottom panel) in rice. In Arabidopsis, SOS pathway regulates ion homeostasis and Na+ exclusion, and thus provides salt tolerance. We cloned and characterized SOS1 (plasmamembrane Na+/H+ antiporter), SOS2 (Serine-threonine protein kinase) and SOS3 (Calcineurin B-like Ca2+ sensor protein) genes from wheat and Brassica, and showed the conservation of SOS pathway and its key role in salt tolerance of wheat and Brassica for salt tolerance. Effect of salinity stress on transcript abundance of SOS1, SOS2 and SOS3 genes in leaf and root tissues of wheat genotypes. Plants were subjected to three treatments: Normal irrigation (control); 100 mM NaCl solution; 200 mM NaCl solution. NUE in wheat: Wheat genotypes were evaluated for NUE under zero N (N0) and 120 kg N (N120) applications in the field conditions. Among the 110 genotypes, 23 were identified as N efficient, while 17 were categorized as inefficient. Efficient- EC-556434, BT-Schomburgk, PBW-394, Arrino and Roller and Inefficient- Stretton, Kater-1, Bevy-1(Med), Triticale and Gluyas Early were crossed with each other and RILs are being developed for gene mapping. Phosphorus uptake efficiency (PUE):Developed a technique for rapid and easy screening of genotypes for P use efficiency based on total root carbon exudation of 14CO2 labeled shoots and donors for phosphorus use efficiency in green gram and soybean. Organic acids (OAs) exuded from roots help solubilize non-available P in the soil, and thus enhance P uptake efficiency of plants. Hence phenotypic variations for OAs exudation from the roots of green gram genotypes were evaluated by using 14CO2 feeding method. OAs released from the roots mainly consisted of oxalic and citric acids. 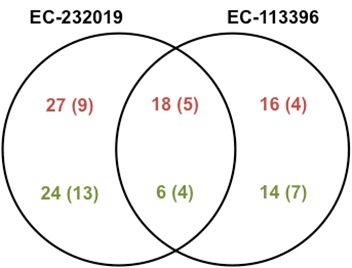 Among the 44 genotypes, PDM 139 produced highest oxalic acid at low P conditions. High carboxylate exudation capacity and improved root traits were found to the key mechanisms for phosphorus uptake efficiency in greengram under P-deficiency stress. The root proteome analysis of contrasting soybean genotypes studied to identify membrane transporters involved in organic anion efflux under P stress revealed 105 (32%) differentially expressed between sufficient and low-P levels. A total of 44 (14%) proteins were down-regulated by more than two-fold under low-P while 61 (15%) proteins were up-regulated by more than two-fold at low-P. Several key enzymes in organic acid synthesis and glycolytic by-pass pathways were differentially regulated under low-P stress in the P-efficient soybean genotype (EC-232019). High [CO2] was found to enhance the assimilate partitioning to root which led to enhanced root surface area and exudation of organic acids and thus helps in P mining under deficiency conditions in wheat. Impact of Elevated CO2 on Nutritional status of crops: Effect of elevated CO2 on grain quality and growth of wheat was studied. CO2 enrichment promoted aboveground biomass, grain yield and test weight. However, grain protein concentration decreased significantly. In grains, the high molecular weight glutenin fraction significantly decreased under CO2 enrichment. Elevated CO2 led to decrease in the concentrations of amino acids including Lysine per unit flour weight. Minerals like Mn and Cu increased, while Zn, Fe and Mg decreased under high CO2 in grains. These results suggesting the need for genetic improvement and change in nutrient management practices to maintain nutritional qualities in future climate change scenarios. Gladiolus Flower Senescence : Ethylene receptorgenes (GgERS1) from ethylene insensitive gladiolus were cloned, and these genes were functionally validated in tobacco and tomato. 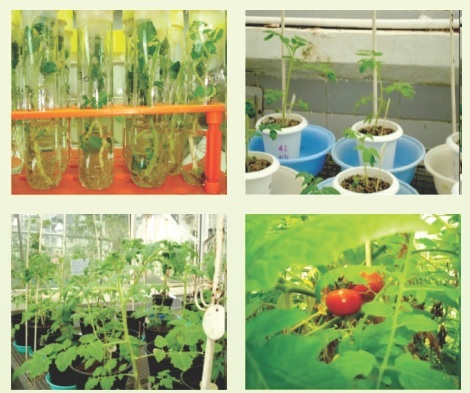 Tomato transgenics for delayed ripening/senescence developed by over-expressing ethylene receptor gene (GgERS1). 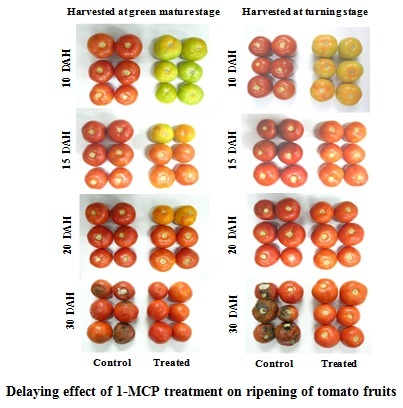 Ethrel induced fruit ripening was delayed in transgenic tomato. Enhancement of vase-life of cut flowers: Studies on nitric oxide (NO) in regulation of flower senescence in gladiolus resulted in identification of Sodium Nitroprusside (SNP) (NO Source, 100 ppm) to enhance the vase-life of gladiolus flowers by 4-5 days. Enhancement of shelf-life of tomato: Postharvest treatment of 1-Methylcyclopropene (1-MCP, 0.3 µl l-1 for 24 h) extended the postharvest life of tomatoes by about 18 to 24 days (fruits stored at 18oC). At higher storage temperature of 25 or 30oC, 1-MCP treatment delayed ripening by 4–14 days. Ethanol-vapour treatment was found to be effective in delaying the ripening of tomato fruits. Static and pulse-field magnetic seed treatment methods have been developed for different crops (cucumber, chickpea, wheat, carrot, cauliflower, etc.) under normal and abiotic stress conditions.Dry seed priming with static magnetic field increases seedling vigour that can be exploited for ameliorating moisture deficit and salinity stress at seedling establishment stage. Enhanced seedling vigour due to homoeostasis of reactive oxygen species maintained by coordinated action of antioxidative enzymes in the germinated seed. 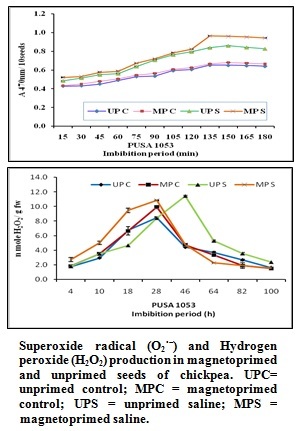 Superoxide radical (O2˙ˉ) and Hydrogen peroxide (H2O2) production in magnetoprimed and unprimed seeds of chickpea. UPC= unprimed control; MPC = magnetoprimed control; UPS = unprimed saline; MPS = magnetoprimed saline. Studies with foliar application of PGRs viz., Thiourea (1000 ppm), BA (40 ppm), TDZ (10 ppm), Gibberellic acid (20 ppm), Thiourea (1000 ppm), and Tannic acid (50 ppm) was found that these PGRs are useful to mitigate drought stress in chickpea. 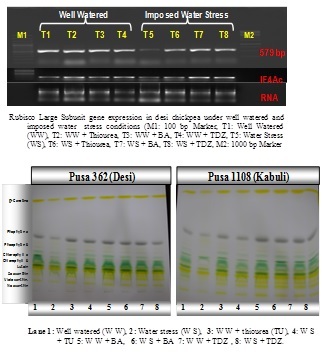 Bioregulators in general and cytokinins in particular helped maintenance of leaf anatomy and protected the photosynthetic machinery by inducing the expression of RbcL and photorespiratory genes and antioxidant enzymes activity during water deficit stress. 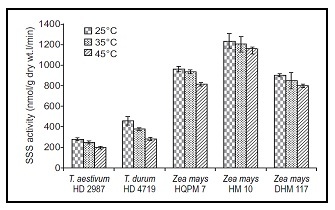 High temperature tolerant genotypes had higher values of zeaxanthin pigment, Fv/Fm ratio, non-photochemical quenching (NPQ), PN, chlorophylls, total carotenoids and lower level of lipid peroxidation over sensitive one under high temperature condition. 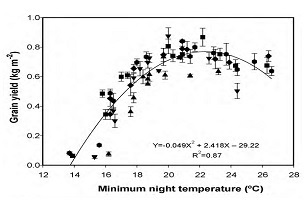 Higher level of zeaxanthin and lower value violaxanthin in heat tolerant genotypes and association of NPQ with heat tolerance indicated that zeaxanthin cycle is involved in high temperature tolerance in chickpea.